Brazil's President Dilma Rousseff has announced a 10% increase in social security payments as well as tax cuts for the less well-off. The changes will affect 36 million low-income families. The announcements come ahead of a October's presidential poll, in which Ms Rousseff will seek a second term. Her popularity has dropped in recent weeks because of high inflation and mismanagement accusations involving Brazil's state oil giant Petrobras. The amendments to the social security programme, known as Bolsa Familia, were announced ahead of Labour Day. 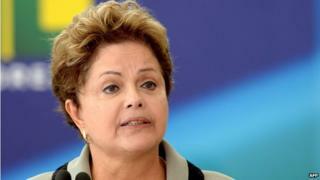 "This will be an important indirect salary gain and more money in the pockets of workers," Ms Rousseff said. Along with the increase in payments there would be a 4.5 % rise in the income bands used to tax workers, she added. Brazil is struggling to keep inflation under the official target rate of 6.5 %. An April opinion poll found support for Ms Rousseff had slipped from 44% in February to 37% in April, though she remains the frontrunner.